1. Preheat the oven to 200°C, gas mark 6. Roll out the pastry and line a 23cm fluted loose-bottom flan tin. Prick pastry base with a fork, line with baking parchment and add baking beans. Place tin on a baking tray and bake blind for 10 minutes. Remove the parchment and beans, and bake for a further 5 minutes. 2. Heat the oil in a pan, fry the onion for 5 minutes and transfer to a bowl. 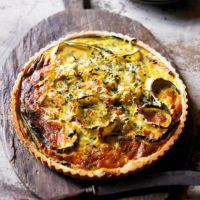 Cut the courgette into thin ribbons, add to the onions with half the cheese and place in the pastry case. 3. Mix the eggs and cream together and season. Pour into the pastry case and sprinkle with the rest of the cheese and thyme. Bake for 35-40 minutes until golden and set. Cool slightly before removing from the tin. Serve with a leafy salad.